There will be a second Trump-Kim Nuclear Arms meeting in February…. I doubt this is going amount to anything…. While the North Koreans have stopped missile and bomb tests? They are STILL working ti increase their nuclear weapons program…. This dog is of the view that there will NEVER be an agreement that the North Korea’s would sign that has them giving up their nukes…..
President Trump and North Korean leader Kim Jong-un will meet for a second summit “near the end of February,” White House Press Secretary Sarah Sanders said Friday. Details: The location of the summit has not been announced. 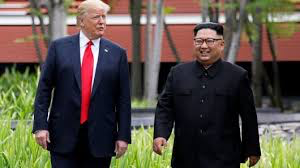 Trump met for about 90 minutes in the Oval Office today with Kim Yong-chol, North Korea’s lead negotiator in denuclearization talks…. “The Kim regime has never disclosed the existence of the Sino-ri Missile Operating Base to the outside world. Ballistic missiles are the primary delivery mechanism for North Korean nuclear warheads.”….